Lepus americanus better known as the snowshoe hare is a widely hunted and eaten animal. This organism is enjoyed by many people that live in the north woods, but is also enjoyed by many other predators. You may know this animal because of its white color in the winter. Its ability to change colors with the seasons is essential for the survival of this species. 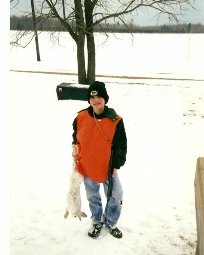 My brother with his first snowshoe hare. The snowshoe hare closely resembles a common rabbit, but if closely examined some major differences can be found, including reproduction, habitat, size and certain adaptations that make it capable of living in extreme conditions. Photo of snowshoe hiding under spruce tree taken from Ohio Sate DNR.